2015 marked our second full year in partnership with the New York City Police Department (NYPD), and the results continued to break records: 677 animals were treated and 158 cruelty arrests were made, representing 60% and 18% increases respectively over 2014. But the partnership is about so much more than numbers—it’s about the real animals whose lives have been changed for the better through our work. These animals have suffered abuse, neglect and unthinkable cruelty, but thanks to the NYPD-ASPCA partnership, their futures are looking very bright. Here are some of their stories. Last January, seven-month-old puppy Lacey was found buried in the snow after being punched and beaten with a shovel. A 43-year-old man was arrested for the horrific crime, and the sweet pit bull mix was taken to the ASPCA Animal Hospital for critical treatment. Given Lacey’s extensive injuries, our medical staff felt that an experienced foster home placement would be the best way to help her heal, and to determine if the puppy could manage her physical limitations outside of a hospital. 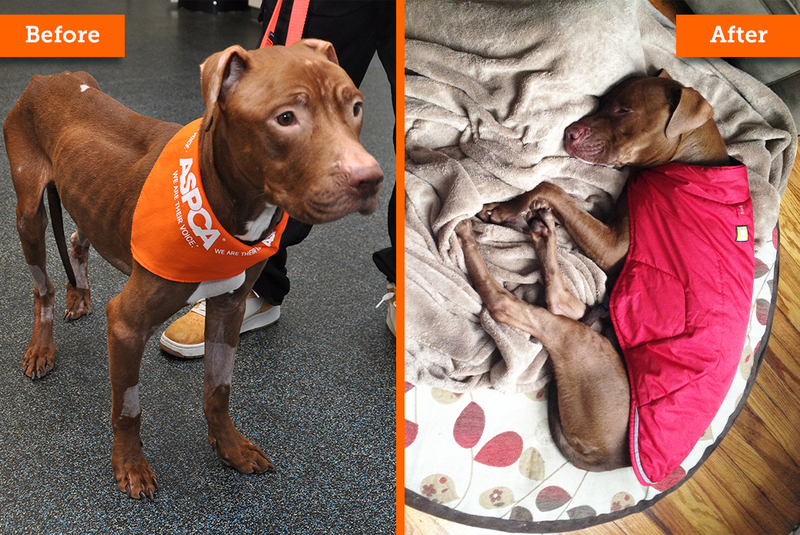 In March, ASPCA employee Dara R. and her boyfriend, Benjamin M., agreed to take Lacey in as a temporary foster—but it didn’t take the long to figure out that their foster arrangement was destined to fail. “She became a part of our lives so quickly. We just couldn’t imagine giving her back!” Dara recalls. In May 2015, they made the adoption official and renamed her Peanut Butter. Now, Dara says, “She’s doing really, really well. Her adjustment was probably a lot smoother than anyone expected. She’s learned to get around in her own way and can compensate for some of the weakness she has from her past injuries. Her favorite thing to do is snuggle, and she normally falls asleep on her back with all four legs in the air." Janet was one of three Shih Tzus rescued by the NYPD during a drug bust in June 2015. 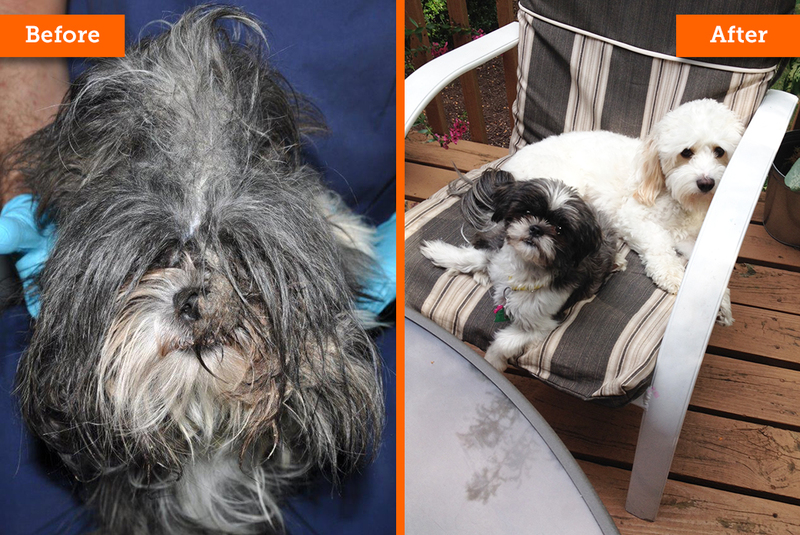 Her coat was so severely matted that it required a medical grooming, and the shocking before-and-after photos caught the attention of Bill Cook, Chief Investigator for the Office of the Special Narcotics Prosecutor. Bill and his wife, Maryann, were looking for a new canine family member after their Shih Tzu of 17 years passed away. When he saw Janet’s photos, he knew she had to come home with him. The couple renamed her Junie, and now she is living a life of comfort. “She’s our little baby,” Bills says. “She wakes me up each morning and comes to sleep with us each night. Everyone just loves her. You couldn’t ask for a sweeter dog.” Bill also tells us that Junie loves running around the family’s back yard with another dog or chasing after her favorite bacon-scented squeaky ball—but more than anything, she prefers curling up on a warm lap. 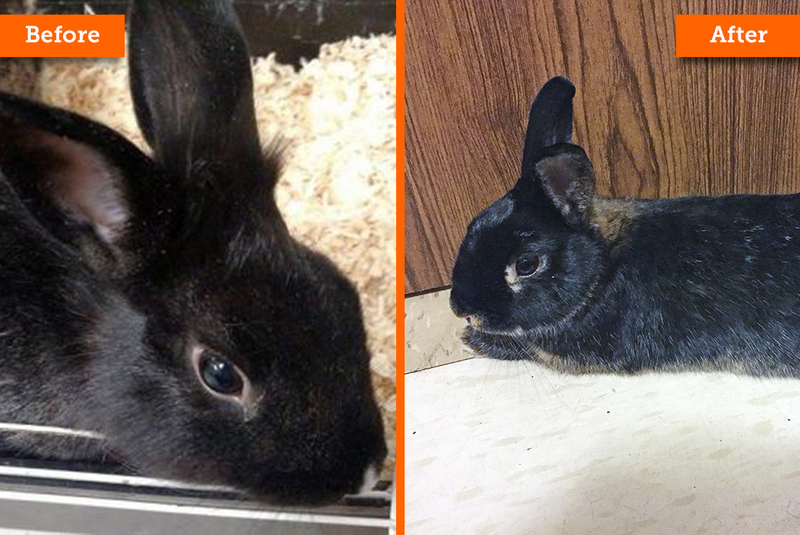 Just one year ago Sebastian, an adult black-and-brown rabbit, was living in squalid conditions in a Brooklyn lot with about 180 other bunnies. Many were suffering from multiple injuries and illnesses. After the rescue, which took place on two different days, the ASPCA examined and helped provide veterinary care for all of the seized bunnies—including Sebastian. Eventually Sebastian and around 150 of the bunnies went to live in Dallastown, Pennsylvania, at Ani-Care Animal Hospital. He’s now back in Brooklyn—but this time as the pampered pet of the Triumph family. When Kelly Triumph’s husband saw the ASPCA’s announcements for rabbit adoptions on December 12, 2015, he knew that this was the time to fulfill his wife’s long-time dream to own a bunny and get the family’s first pet. Sebastian David—as he was christened by Kelly’s young son—has been a spirited addition to the family. Many of you may remember Fraggle, the extremely malnourished three-year-old pit bull who was found zipped inside of an abandoned suitcase in the Bronx, New York last January. 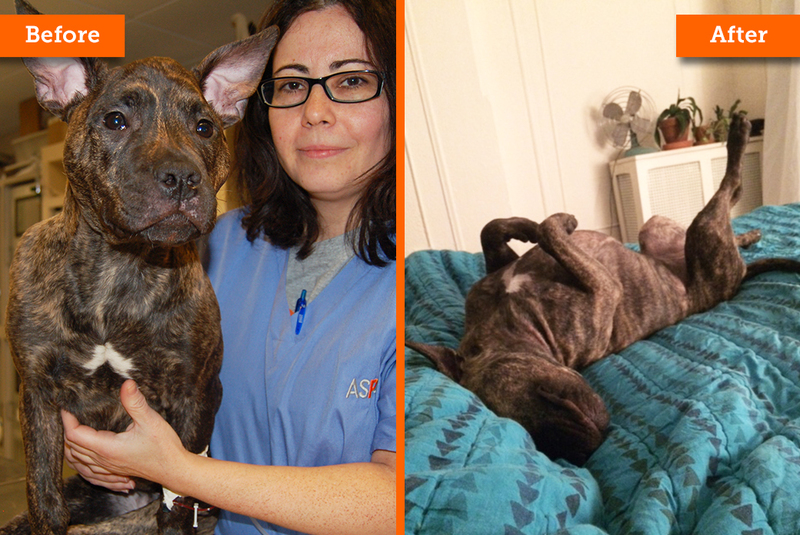 After his rescue, Fraggle weighed only 30 pounds and could not walk or eat on his own for several weeks. At times it was uncertain if the shy dog would even make it, but by May 2015, he was healthy enough to begin searching for his new home. Jobanny Estrella-Elmonis and her husband were looking for another special dog to help keep their older pit bull mix, Grace, company, and they fell in love with Fraggle’s sweet face. They knew he was meant to go home with them. In Jobanny’s home, Fraggle has continued to gain weight—now he’s over 55 pounds—and adjust to his new home with the help of Grace, who accompanies him everywhere from the dog park to the groomer. They often snuggle in the same bed. Jobanny renamed him “Prince Fraggle,” since he came from the worst possible situation and is now treated like royalty! We are so thrilled for all of the animals rescued through the NYPD-ASPCA partnership last year, and we cannot wait to save even more lives in 2016.